Wow. That title sure is a tongue twister. Just trying to say it was a trick. And speaking of tricks . . . a little more than a week ago, I wrote a post called “Six by Six?” I confessed that I do not know any tricks, revealed my human mommy’s silly plan for me learn six tricks by my sixth birthday (which is next month), and asked for your input on what tricks I should learn. 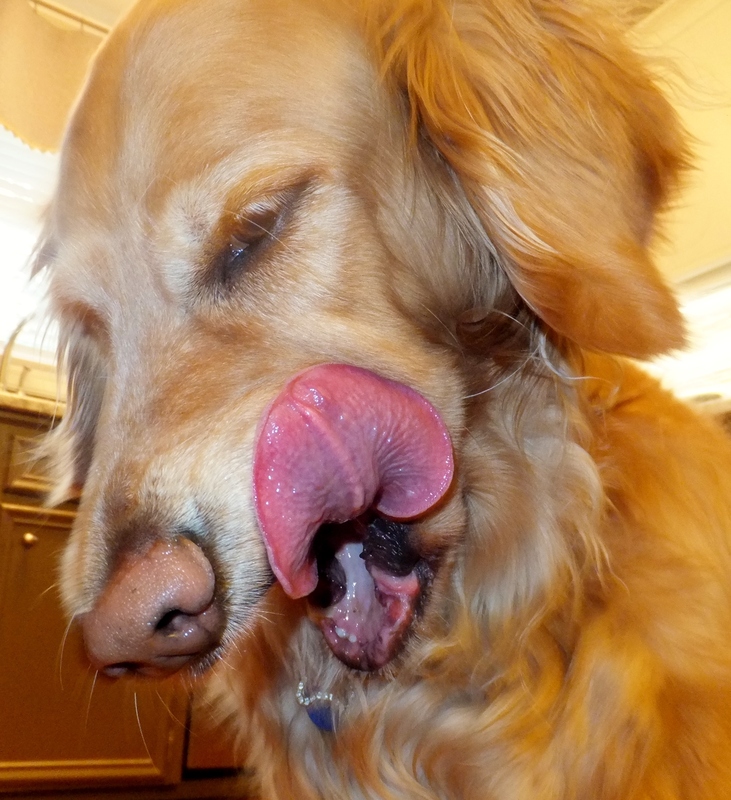 I loved your comments, and I was very surprised to learn that most of my four-legged friends don’t do any tricks either. 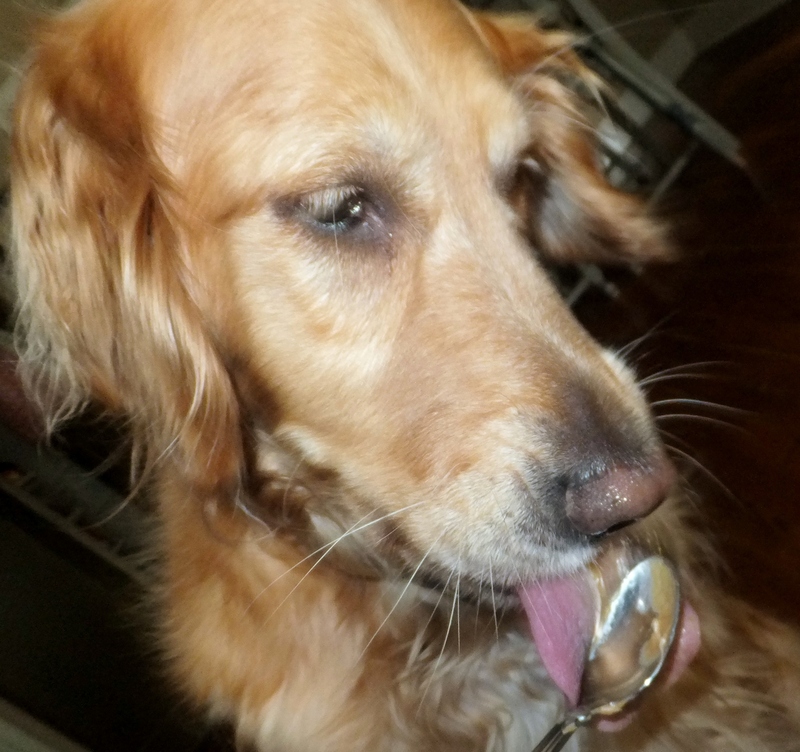 I thought for sure that my mommy would give up on this ridiculous trick idea after she saw that, but no such luck. It appears that we are forging ahead with the trick lessons. 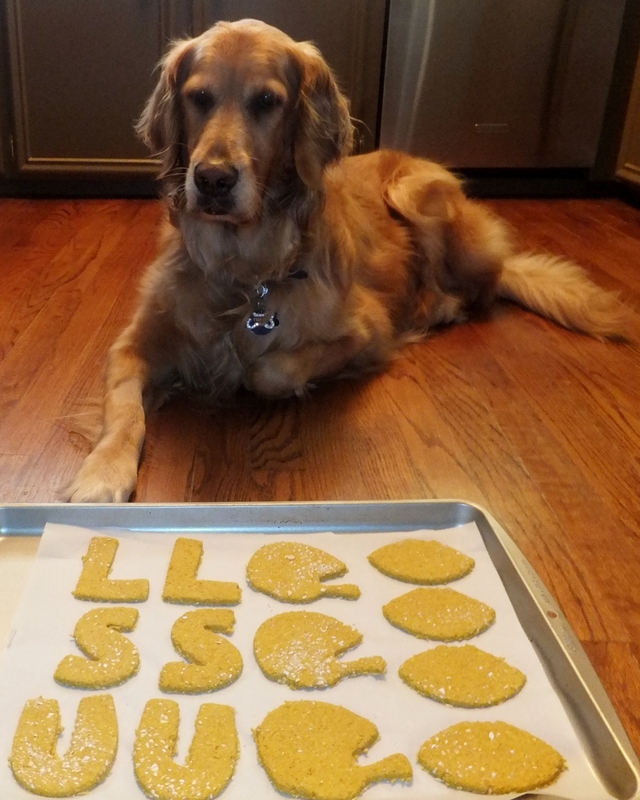 Naturally, we had to find a tasty treat recipe for these trick lessons. You didn’t honestly think I’d fall for this crazy plan without the promise of treats, did you? So Mommy turned to The Organic Dog Biscuit Cookbook from the Bubba Rose Biscuit Company and zeroed in on a recipe for Tuna Snackers, billed as “high-protein, low-fat, allergy-friendly, and filled with beneficial omegas.” This trick-learning thing could require a lot of treats, so it was important to find something that is low-fat. Mommy liked the limited ingredients and simple preparation. I was pretty excited about the tuna and more than pleased to clean the little cans before they went into the recycling bin. I supervised while Mommy combined 1-1/2 cups of oat flour, 1-1/2 cups of brown rice flour, 1/4 cup of oat bran, 6 ounces of albacore tuna in water, 1 egg, and enough water to form a dough ball (a little more than 1/2 cup added slowly). 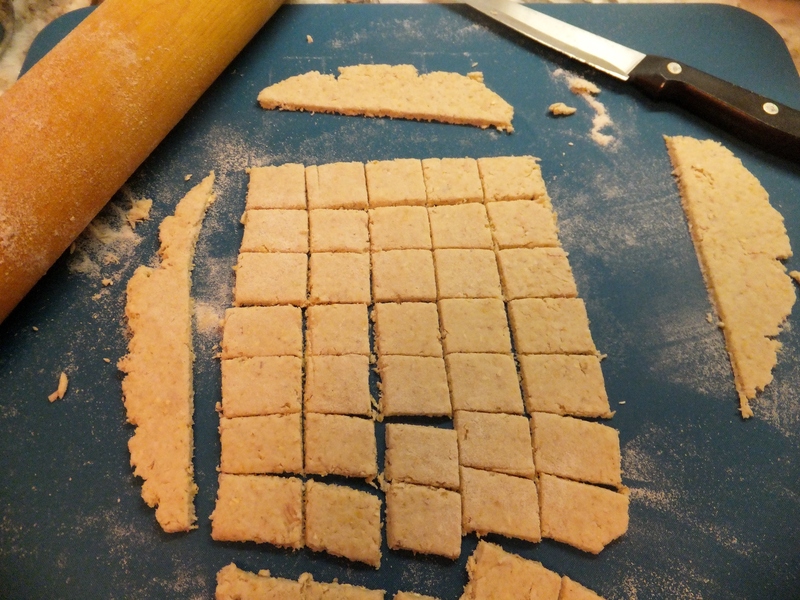 The recipe says to roll the dough on a lightly floured surface to about 1/4 inch thickness and then cut into shapes. Since we’ll be using these tuna treats for trick training, Mommy simply used a knife to cut the rolled out dough into little squares. 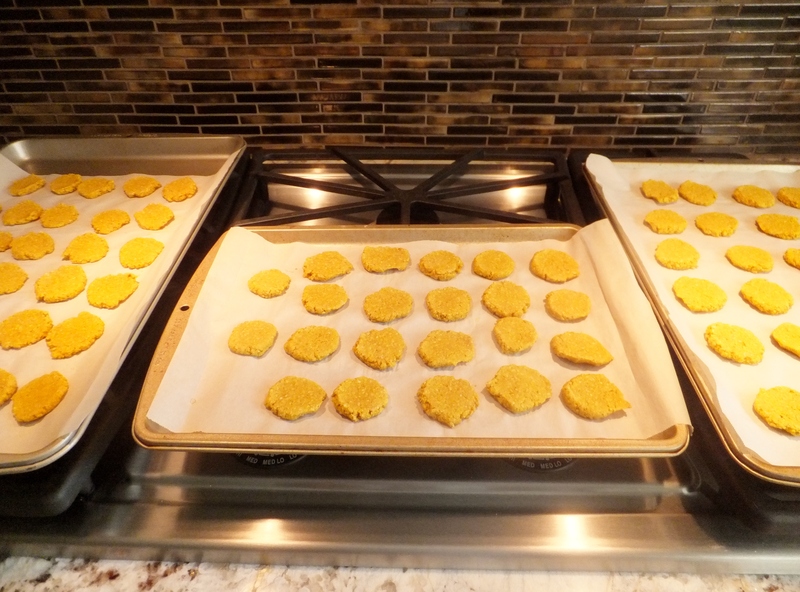 Then the treat squares went onto a cookie sheet lined with parchment paper and into an oven preheated to 350 F to bake for 22 minutes. Friends, for the life of me I will never ever understand this whole baking step. This just seems like such a total waste of time to me. 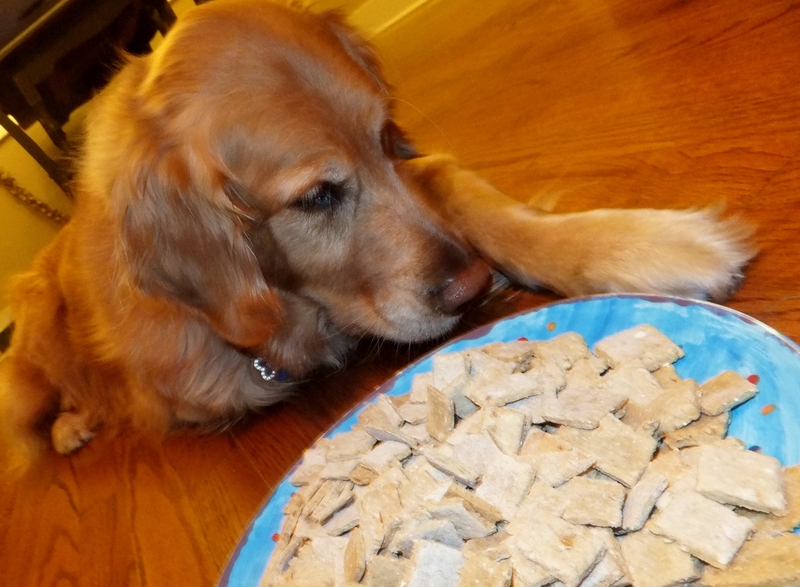 I am more than happy to eat my treats before they go into the oven, but Mommy absolutely insists on baking them. Whatever. Would you just look at all the Tuna Snackers this recipe made. We’ve put some in the refrigerator and the rest in the freezer. I’m pretty sure that one batch will get me through mastering all six tricks. And about those tricks . . . I’ve settled on my six: bow, shake, high five, sit up, speak, and–first up–spin . . . or maybe in keeping with the Tasty Tuesday T theme we should call that twirl! 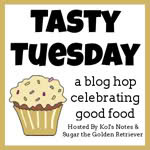 Today, I’m participating in the Tasty Tuesday blog hop, hosted by Kol’s Notes and Sugar the Golden Retriever. You can click on the link below for more yummy recipes and tasty treats. Preheat oven to 350 F. Whisk the dry ingredients together in a large bowl and set aside. Beat together the bananas and butter in a medium bowl until creamy. Beat in water and then eggs one at a time. Add the wet ingredients to the dry ingredients and combine. 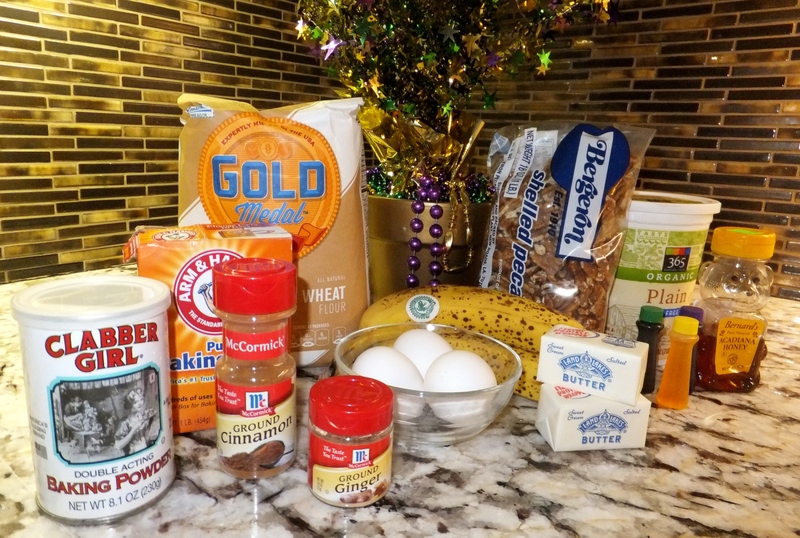 (**At this point the recipe says to add the pecans; but based on Mommy’s research, we skipped this step.) 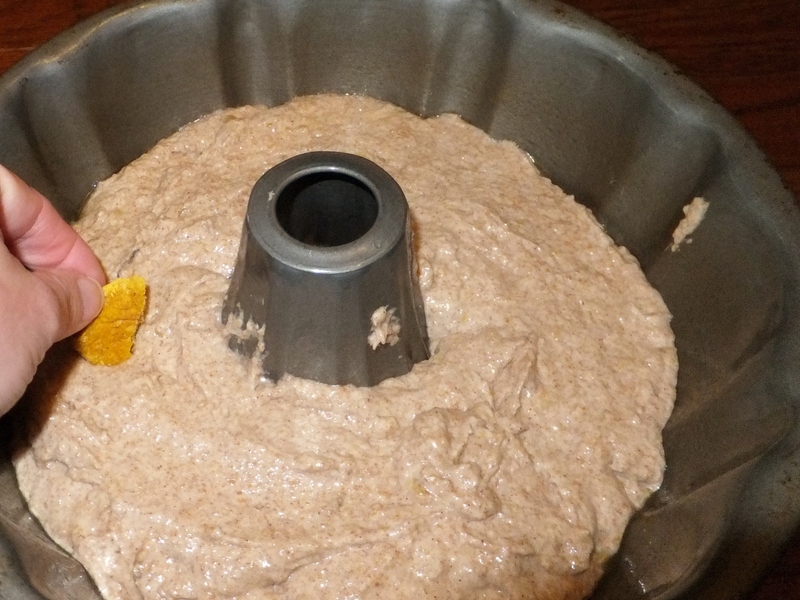 Pour the batter into a prepared Bundt pan and bake for 35 minutes. 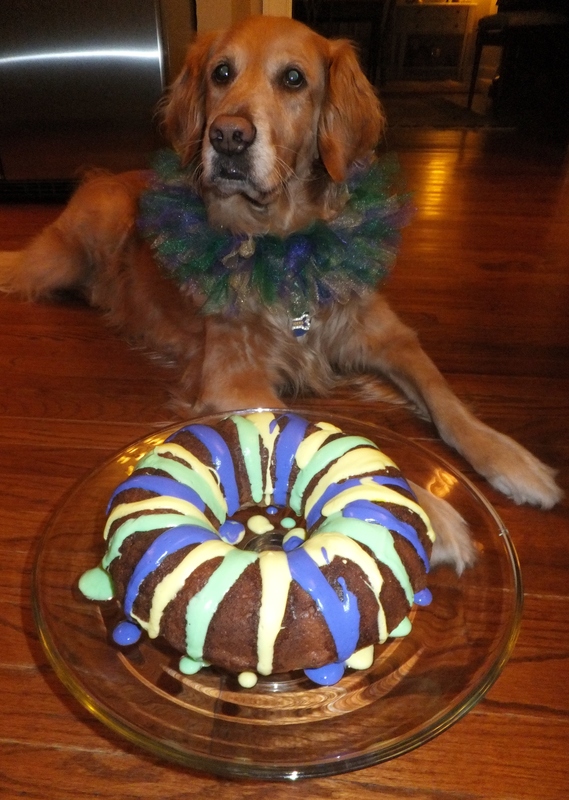 When we poured the batter into the Bundt pan, it seemed a little pitiful. Mommy crossed her fingers (and I crossed my toes) and we both hoped that it would rise a bit while baking. It did. 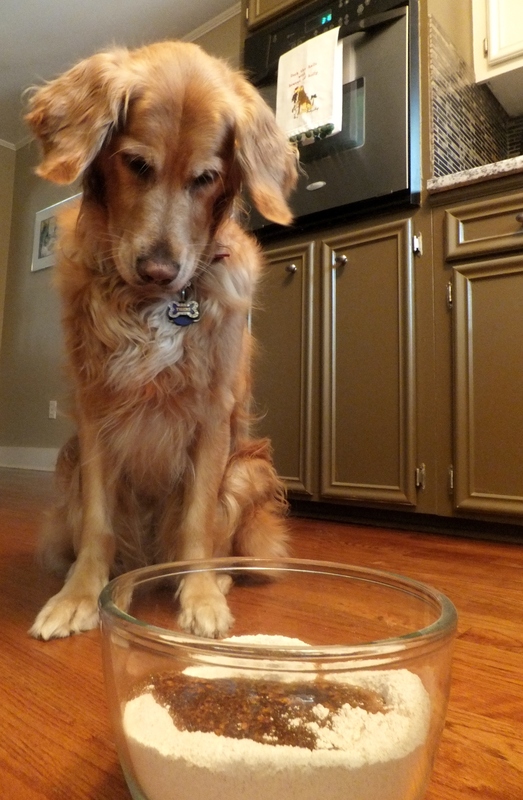 Before popping the cake into the oven, we added a small homemade dog treat. Human King Cakes traditionally are baked with a little plastic baby inside. Whoever gets the baby in his or her piece of cake is expected to purchase the next King Cake or throw the next party. 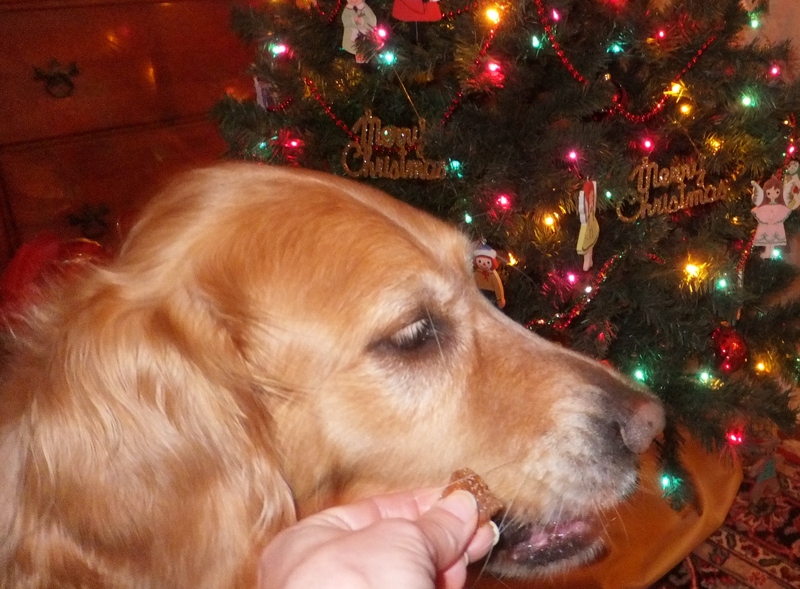 Mommy and I thought it would be fun to put a dog-friendly spin on that tradition. While the cake baked, I helped with cleanup. This is absolutely and positively my very favorite part of Tasty Tuesday! After the King Cake cooked and cooled, Mommy mixed the icing. The recipe didn’t have specifics on amounts, so Mommy used about two tablespoons of yogurt, 2 teaspoons of honey, and a few drops of food coloring for each color. It seemed to work. As you can see, I was a little disappointed that I didn’t get a piece of King Cake after my dinner tonight. Mommy says we’re going to let the cake rest in the refrigerator overnight. 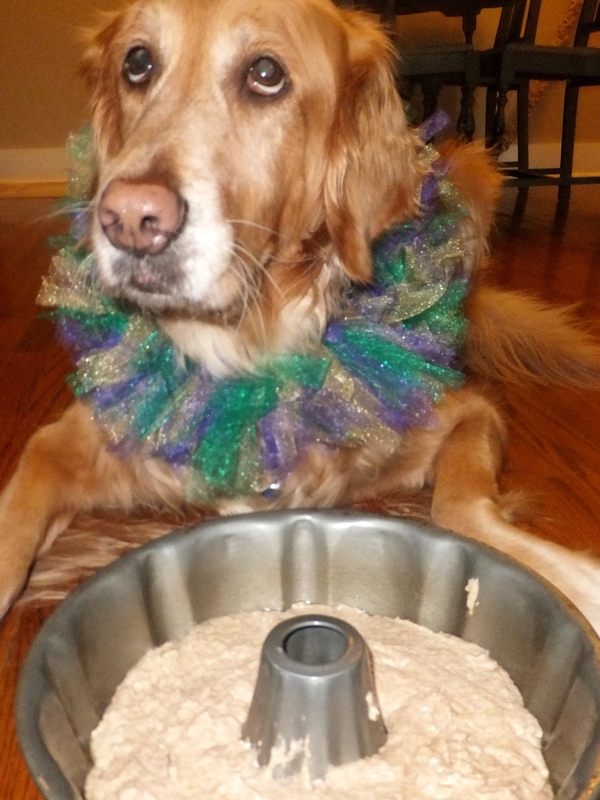 Then tomorrow we’ll deliver pieces of King Cake to my canine friends. I can’t wait to see who gets the baby hidden dog treat . . . 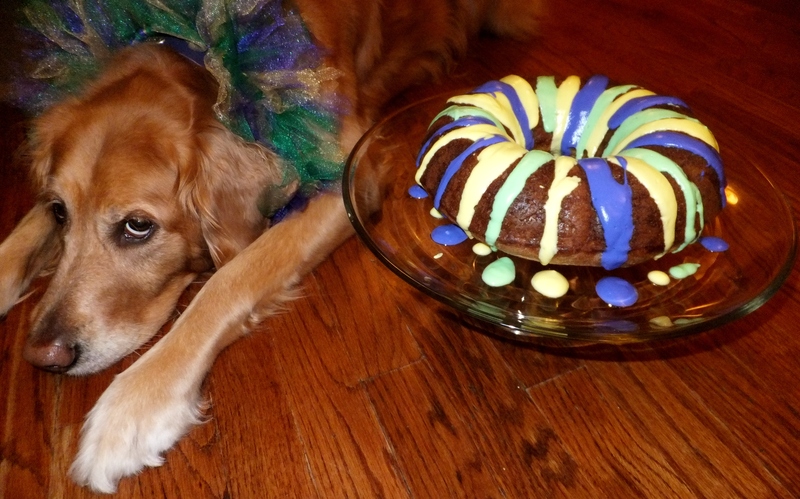 I also can’t wait to get my very own piece of Dog-Friendly King Cake. Happy Mardi Gras! There’s a new man in my life. He’s a gingerbread man, and boy is he tasty. 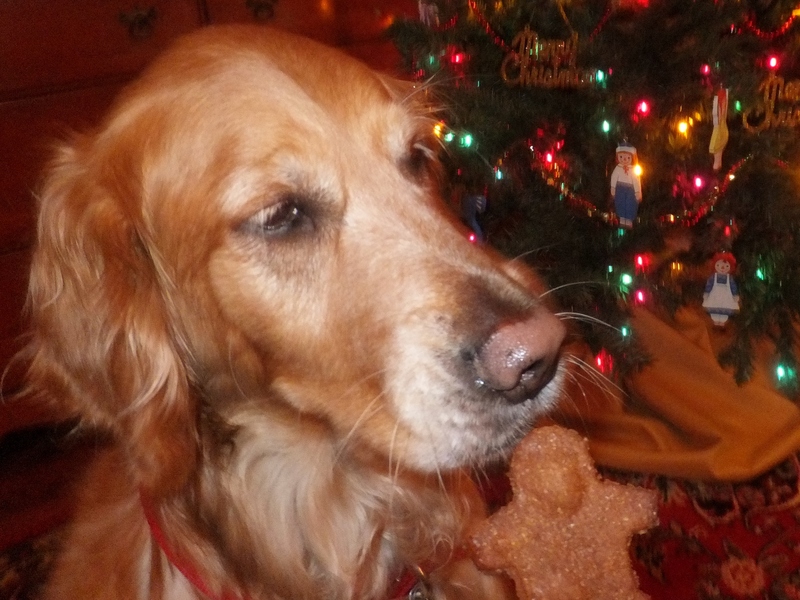 I met the little gingerbread man last night when my human mommy and I started our holiday baking . 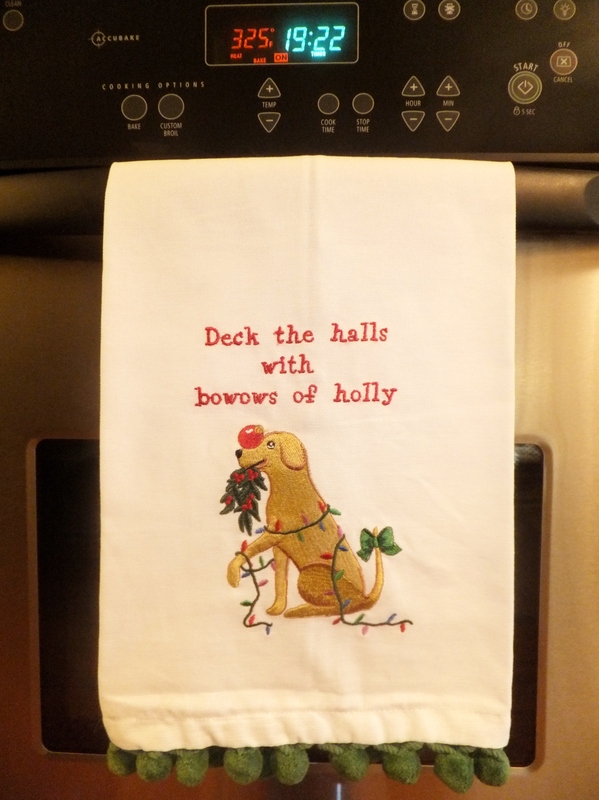 . . for my canine friends, of course. While I supervised, Mommy preheated the oven to 325 F. She whisked together the flour, ginger, cinnamon, and cloves in a large bowl. Then she used a sturdy spoon to combine the molasses, water, and canola oil in a smaller bowl before pouring the molasses mixture into the flour mixture and combining the two with a sturdy spoon. And into the oven those little gingerbread men went for 20 minutes . . .
. . . which gave me just enough time for a quick nap. 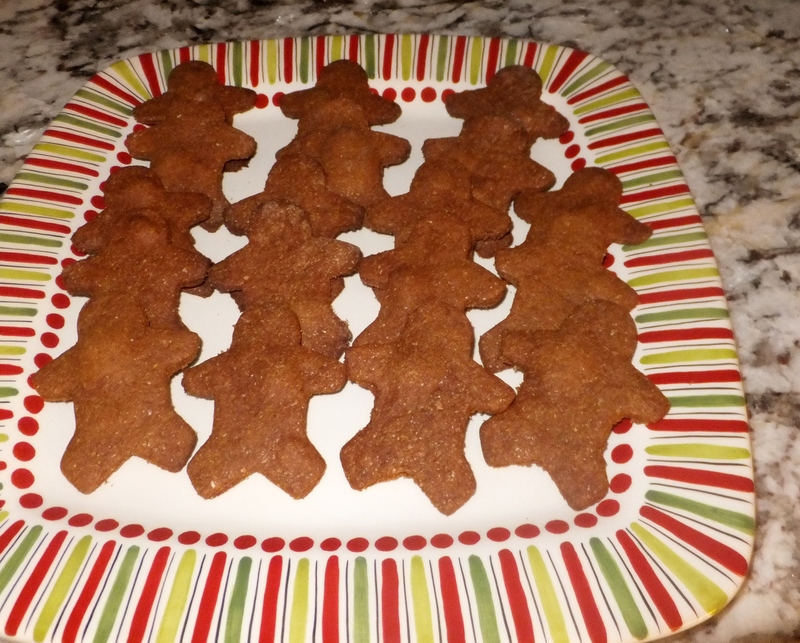 After baking, we let the little gingerbread men cool off before popping them into the freezer. 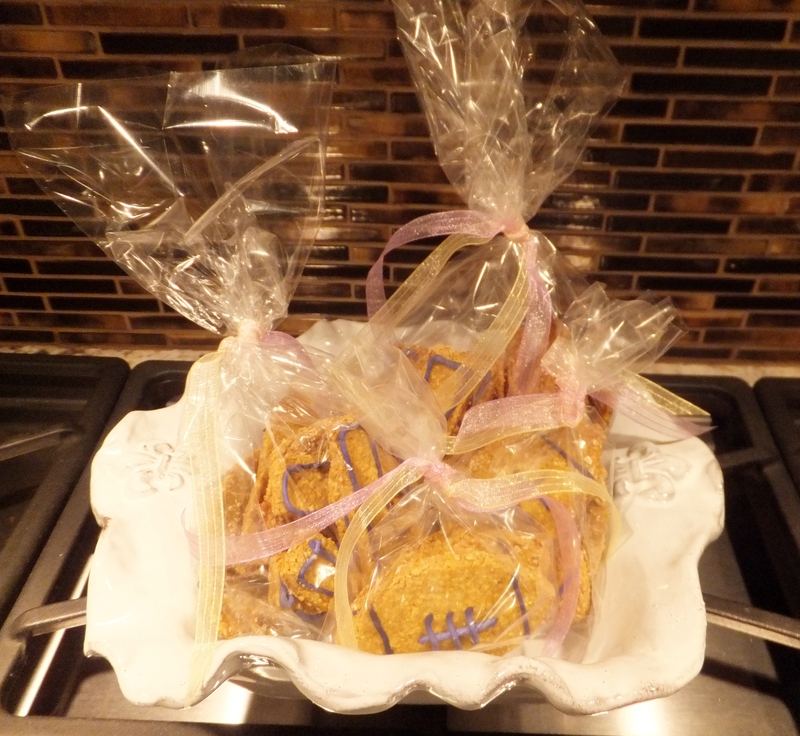 We still have a bit more baking to do before we make treat gift bags for all my neighborhood friends. Mmmmmm . . . 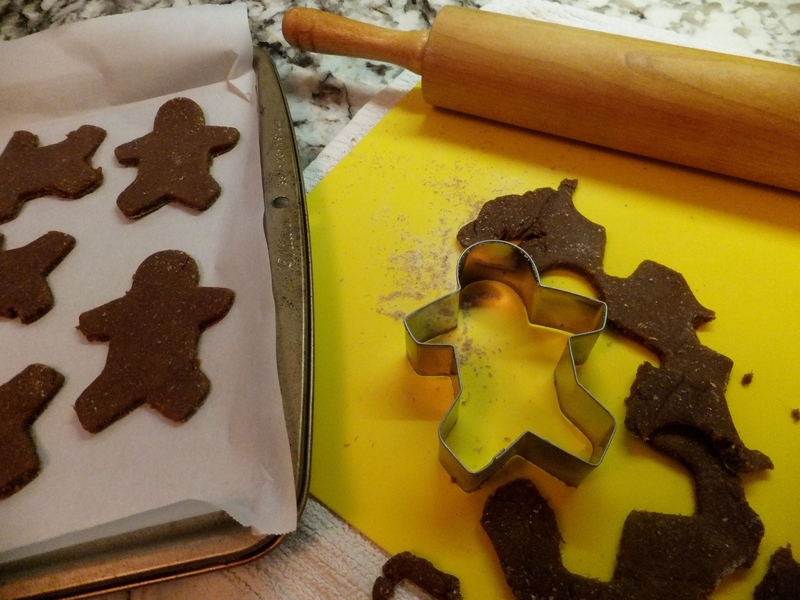 I think my friends are going to love the little gingerbread man just as much as I do. 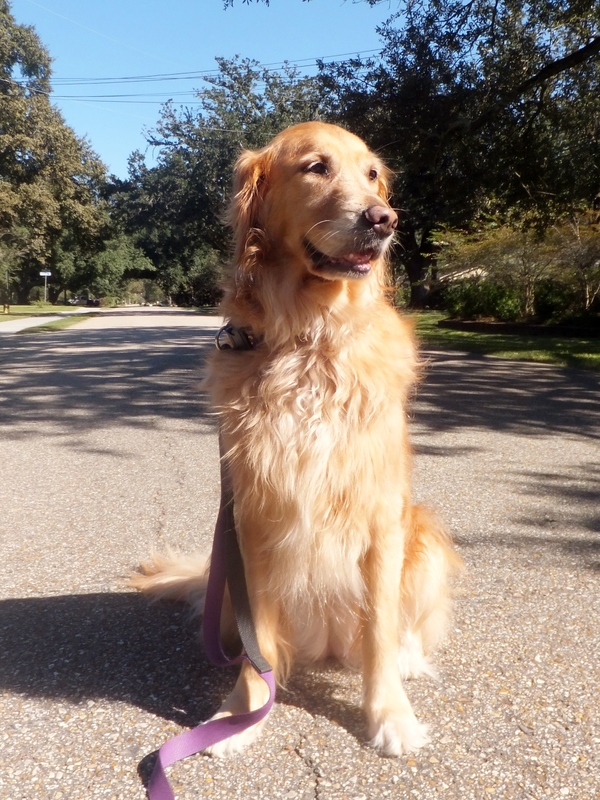 Why Did the Golden Retriever Cross the Road? To visit the chickens, of course. 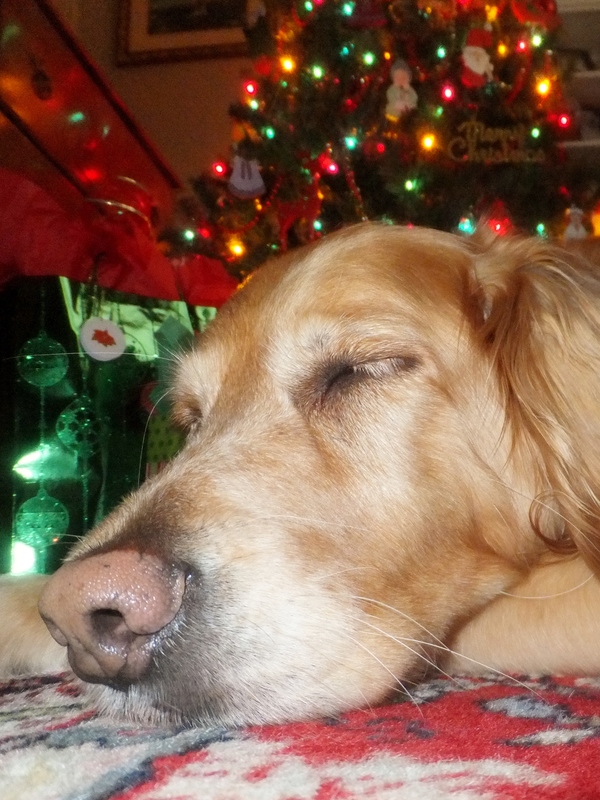 I’m a pretty lucky dog. I live in the middle of the city, and yet I have a miniature pony that lives right around the corner and a couple of chickens who recently came to roost (haha, get it?) across the street. That’s Number 3 on the left and Wannabe on the right. You might be wondering why Number 3 is named Number 3. Well, at one time there were three chickens, and Number 3 was number three in the pecking order (I made another chicken joke there). Then it turned out that one of the chickens was a rooster, so he went to live in the country. So recently I got to visit my chicken neighbors for the first time. I was pretty interested, as you might have gathered from the tension in my collar . . . and you can’t even see the tension in my human mommy’s hand as she maintained the death grip on my leash. 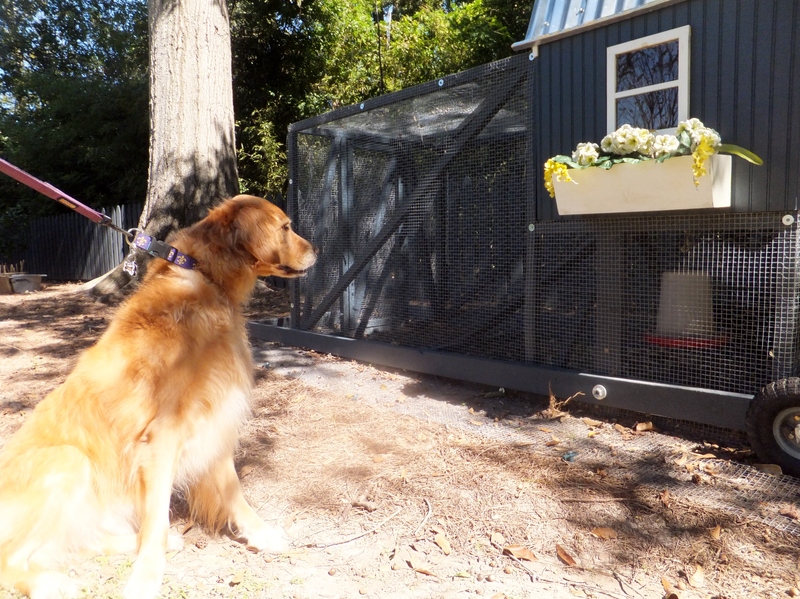 I’m not quite sure why my humans were so surprised by my perhaps-overly-excited attraction to the chickens. Afterall, I am a bird dog. 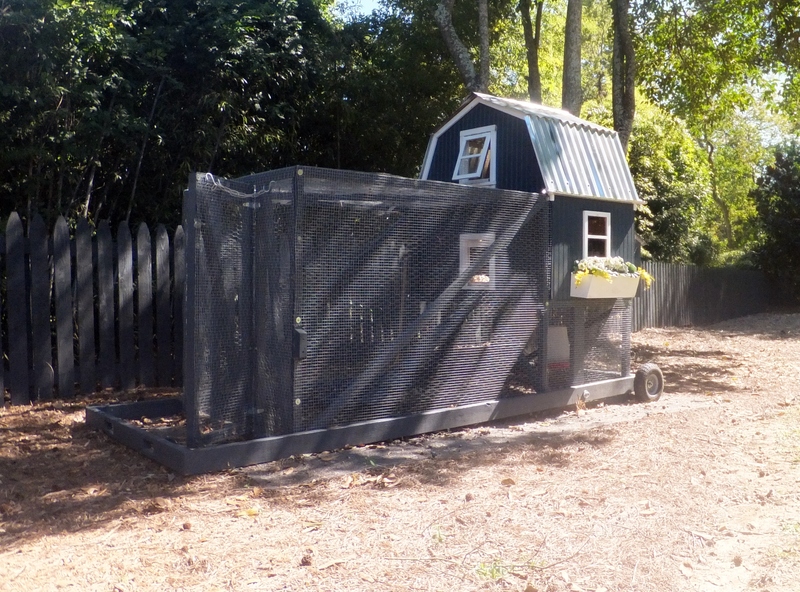 Mommy quickly determined that it might be a good idea for me to get away from the hen-house, otherwise this blog post might have become a very different take on Tasty Tuesday. I took one last look as my human daddy dragged me away. 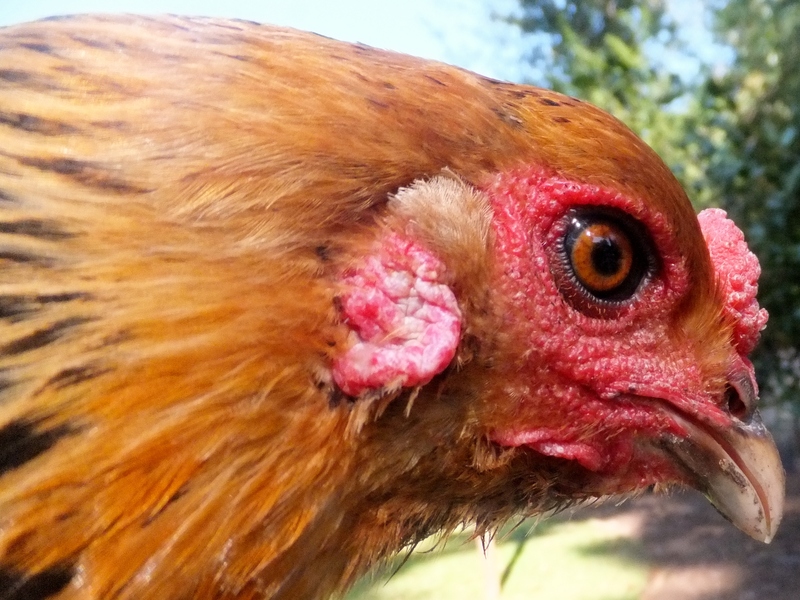 I have a pretty good idea that I won’t ever be allowed to visit the chickens again. But my mommy stuck around to learn more about Wannabe and Number 3. They’ll be one year old in February. They laid their first eggs when they were around eight or nine months old, and they’ll lay eggs for the first five to eight years of their lives. That’s a lot of eggs. Number 3 is what’s called an olive egger because she lays eggs that are olive-green, and Wannabe is a pale blue Easter egger. 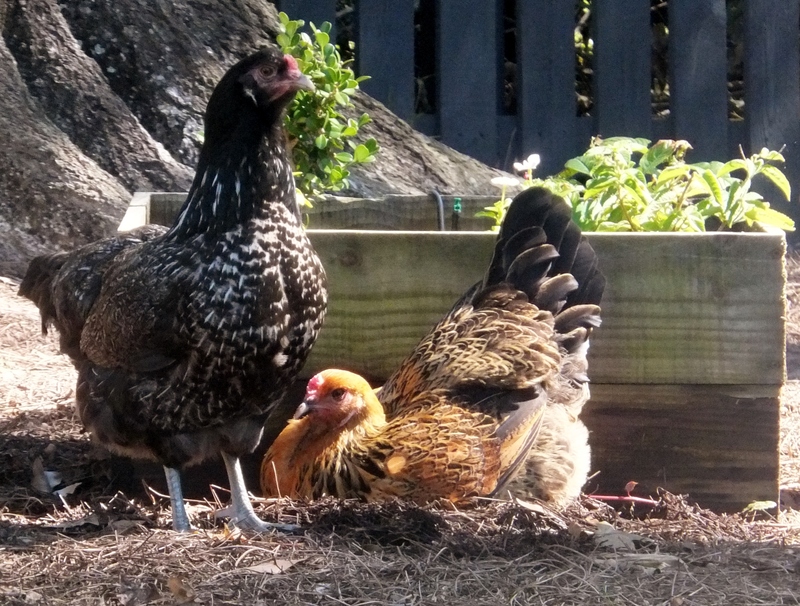 They eat chicken feed, but they also get kitchen scraps from their humans (hey, I want to be a chicken) . . . pretty much everything except chicken. Their human mother says it just doesn’t feel right to feed the chickens chicken. Makes sense to me. Their favorite human food is cooked spaghetti. They need all those spaghetti carbs because during the day they are free to roam around their big backyard. 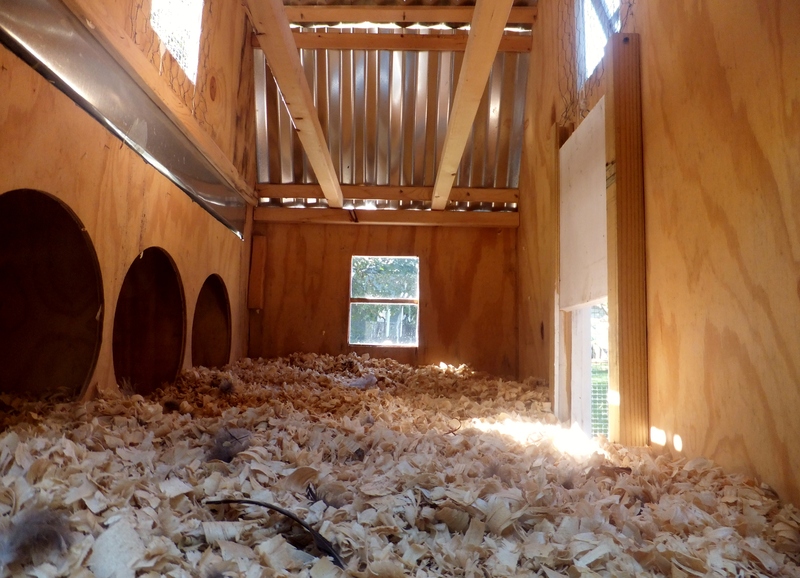 In the evening, they settle into this beautiful chicken coop. Eat your hearts out, pups. This thing is way nicer than any dog house I’ve ever seen. They perch in this area to sleep . . .
. . . and this is where they lay their eggs. Look closely and you’ll notice a couple of golf balls. 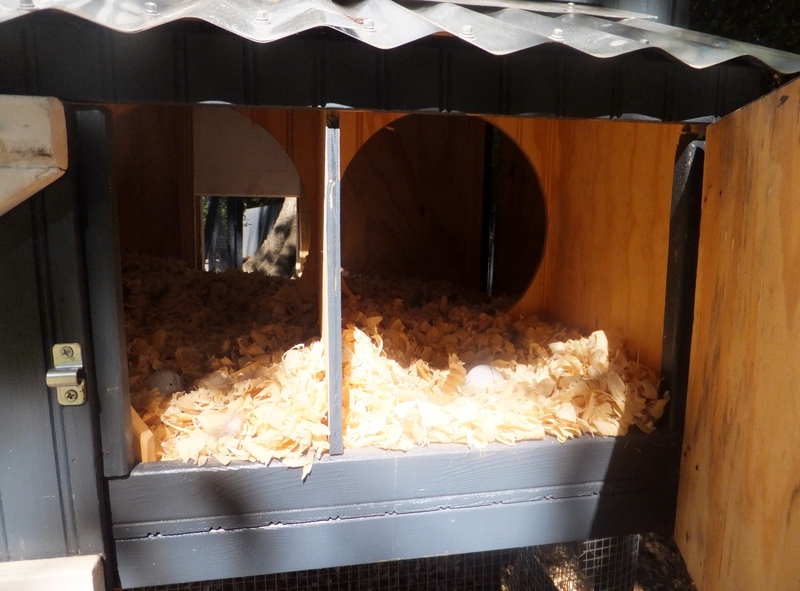 At first, Wannabe and Number 3 were laying eggs all over their coop. 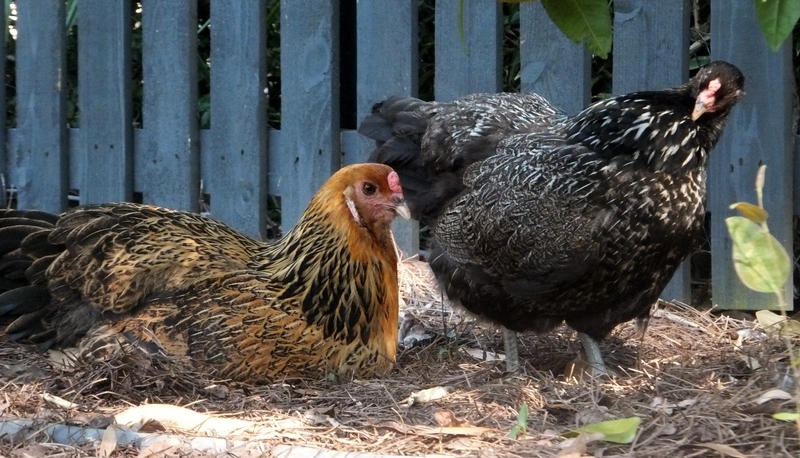 Then their humans read that if you place golf balls where you want your chickens to lay, that’s where they’ll lay. It worked! And look at the lovely eggs that my chicken neighbors shared with me. 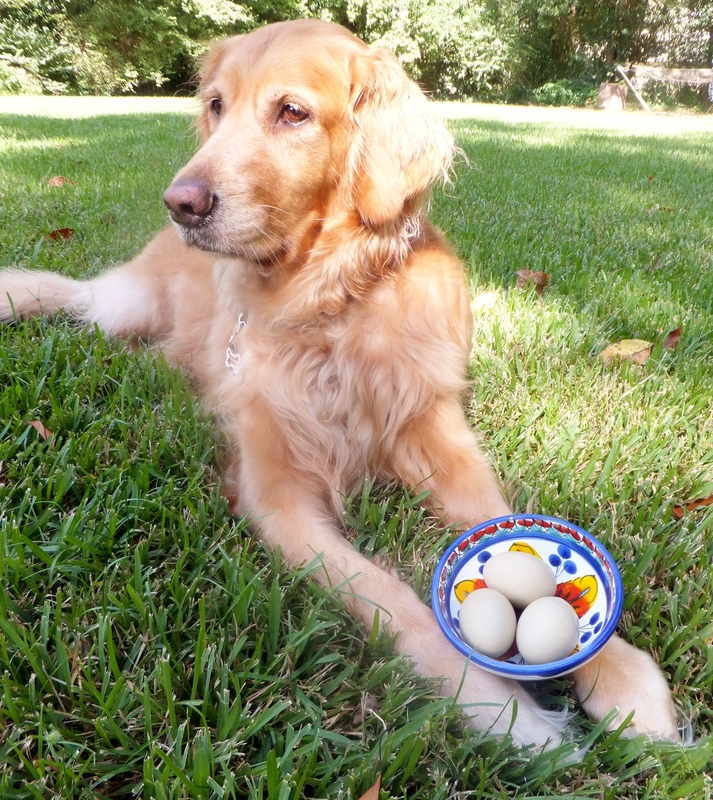 Mommy used a couple to make human treats, but you just knew she had to save one of those special eggs to make some yummy dog treats. 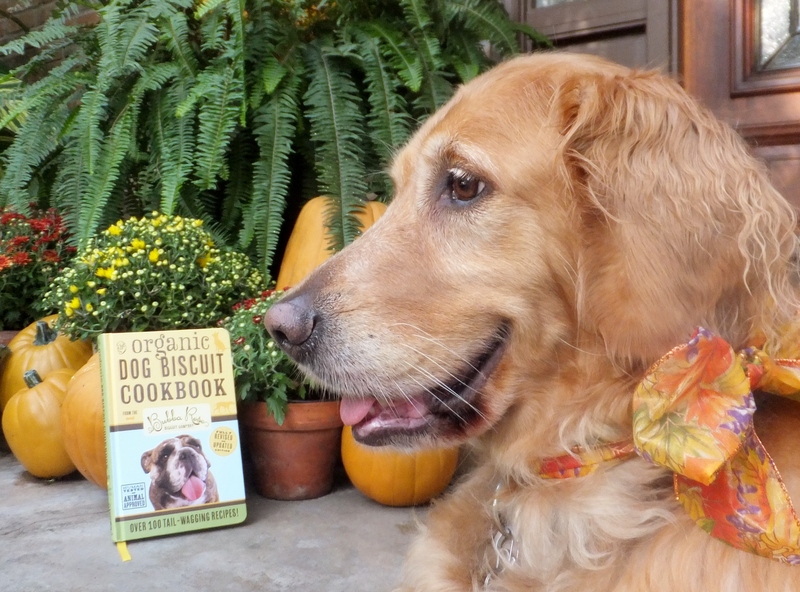 She turned to The Organic Dog Biscuit Cookbook and found a recipe for Pumpkin Drops. 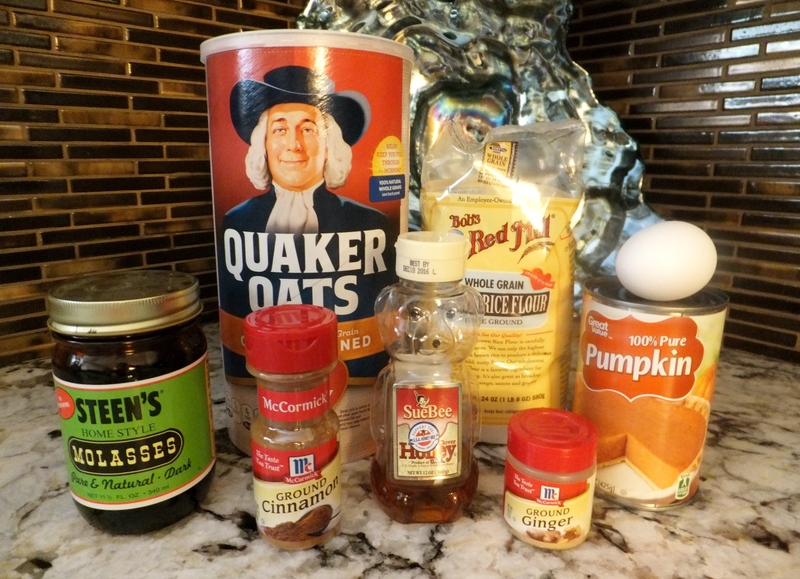 These heavenly pumpkin spice cookies are made with oat flour, brown rice flour, cinnamon, nutmeg, ginger, unsweetened applesauce, canned pumpkin, a little water, and one very special egg. Simply drop about a teaspoon-sized ball onto a cookie sheet, flatten the ball if you’d like, and bake. These treats are super simple because they don’t require any rolling or cutting out, and the recipe makes plenty of cookies to share with your friends. I volunteered for taste-testing duty. Yep, they passed the test with flying colors. 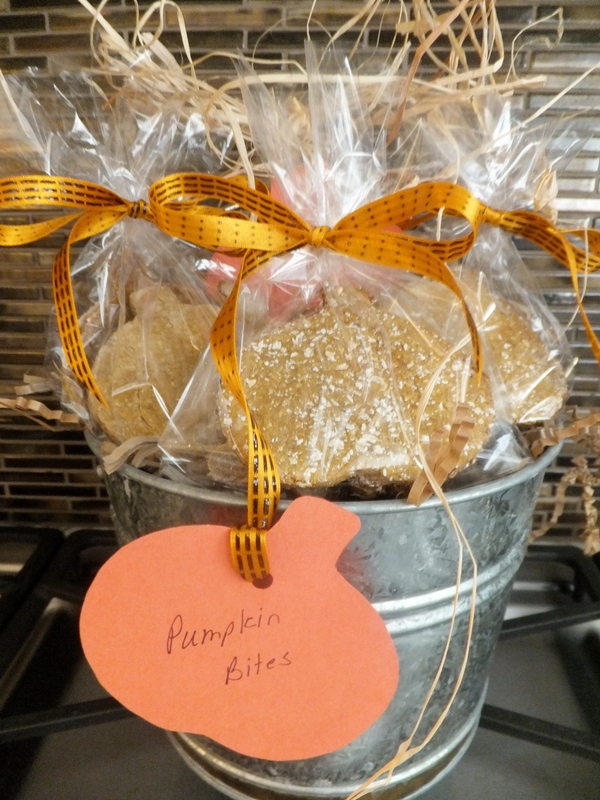 I think I’m going to share some Pumpkin Drops with my new friends Wannabe and Number 3 . . . but I might have to get Mommy to make the delivery. The book opens with an introduction that includes a pantry list, time-saving tips for stocking the pantry and fridge, substitution suggestions, helpful cooking tools to have on hand, and storage tips. 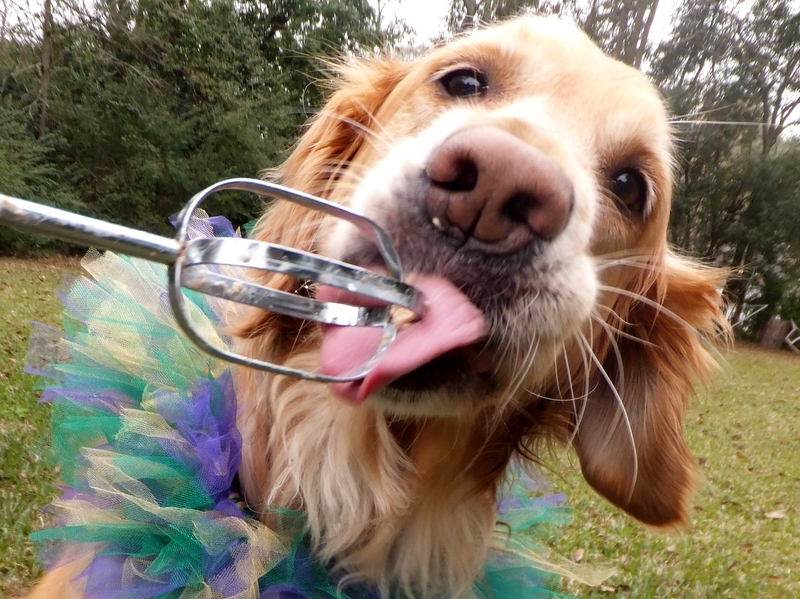 All recipes are free from wheat, corn, and soy (which the authors say are the most common sources of food allergies in dogs), and many include an interesting nutritional sidebar. 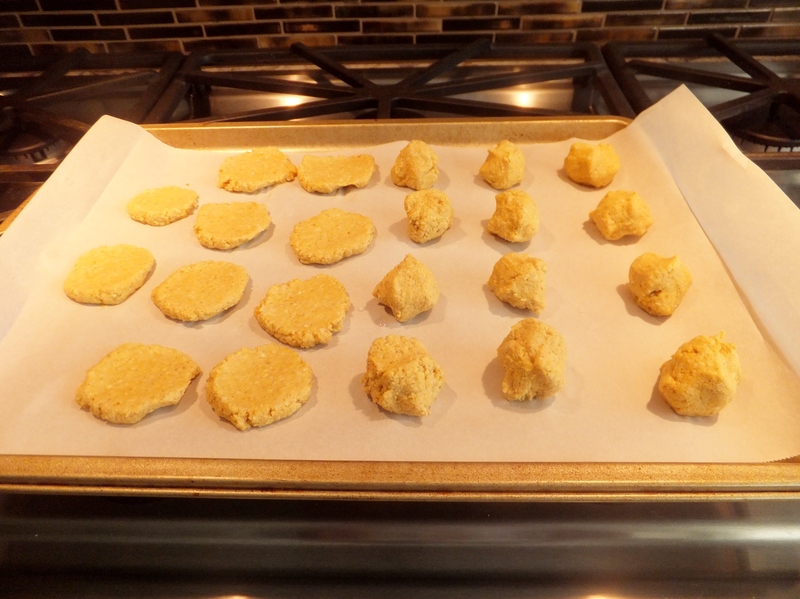 Mommy naturally flipped immediately to the recipe for the month of October–Pumpkin Bites, made with oat flour, brown rice flour, pumpkin (canned or fresh), molasses (regular or blackstrap, cinnamon, ground ginger, honey, an egg, and enough water to form a dough ball. 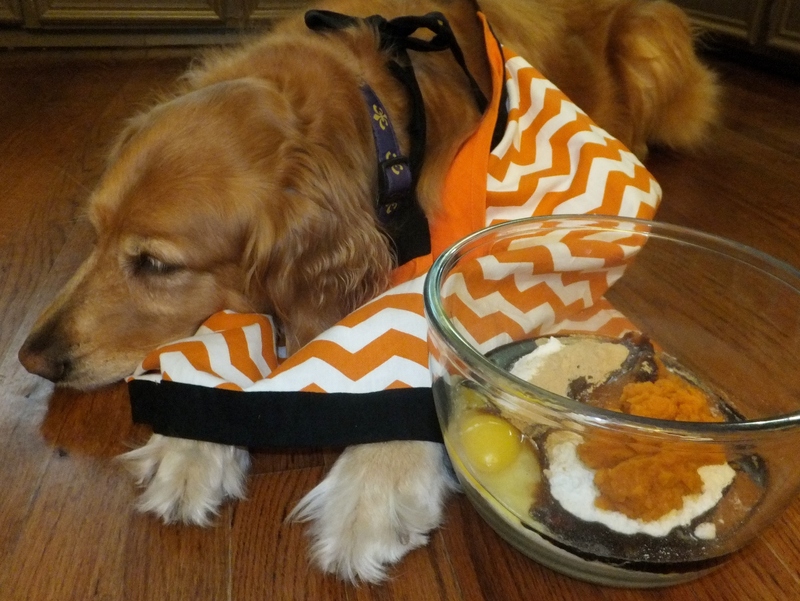 I slipped into my fun fall apron and watched as Mommy combined all the yummy ingredients. 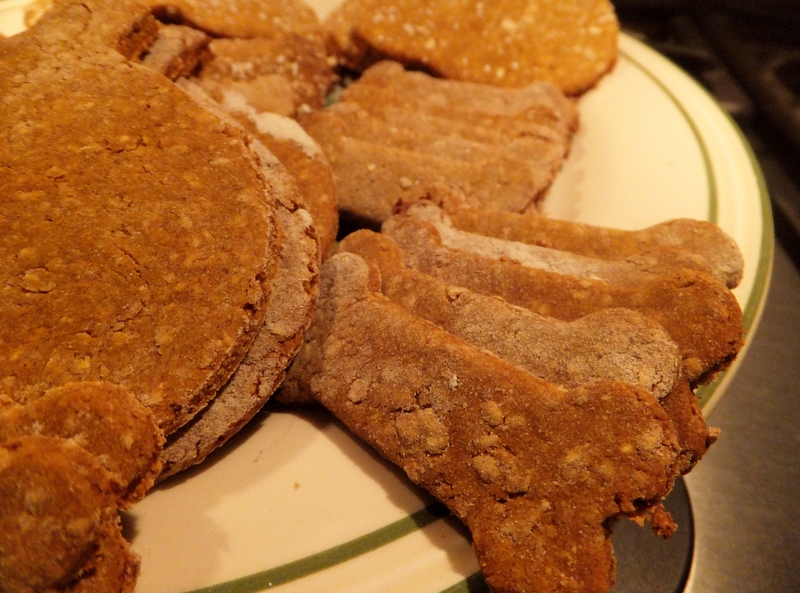 I must have dozed off while she rolled out and cut the dough into festive little pumpkin and bone shapes, because the next thing I knew . . .
. . . the treats were out of the oven and filling the house with the most wonderful autumnal scent. When my human daddy came home, he said the house smelled like pumpkin pie baking. Silly Daddy. He should know that any time the house smells that good it’s because Mommy’s making something special for my friends and me. We packaged the Pumpkin Bites and started delivering joy all around our neighborhood. We even brought some of the treats to our friends in Texas. 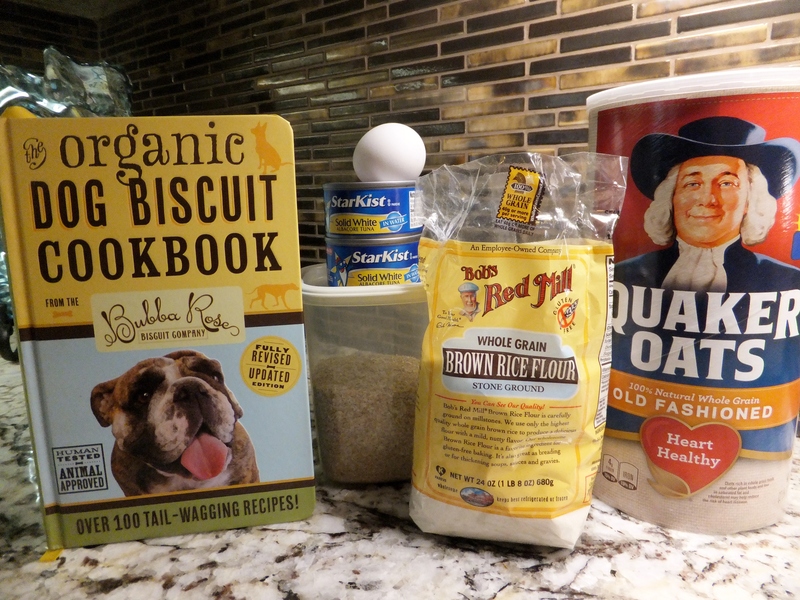 I can assure you that the reviews have been outstanding, and I am definitely looking forward to tasting my way through The Organic Dog Biscuit Cookbook. Who says college football tailgating is just for humans? 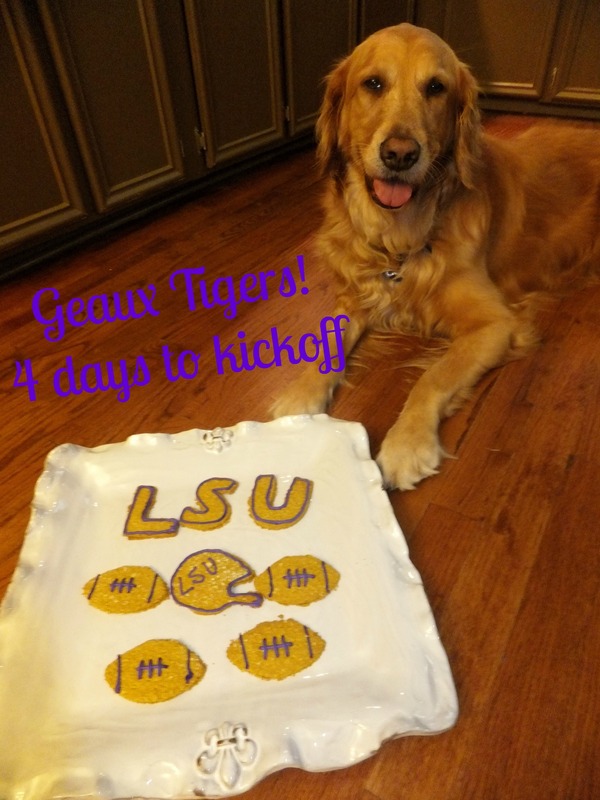 Dogs enjoy a tasty treat before the game just as much as anyone, so my human mommy and I whipped up a little something for me to share with all of my canine friends before the big LSU Tigers season opener this Saturday. To make these tasty tailgating treats, we turned to a couple of recipes that we’ve used before: Happy Hip Bones Treats from 3mbakery and cream cheese frosting from Wear.Wag.Repeat. (You can click here and here for links to the recipes.) I was in charge of quality control, and a I can assure you that the combination of oat flour, peanut butter, turmeric, ginger, and apple cider vinegar more than met my very high standards. 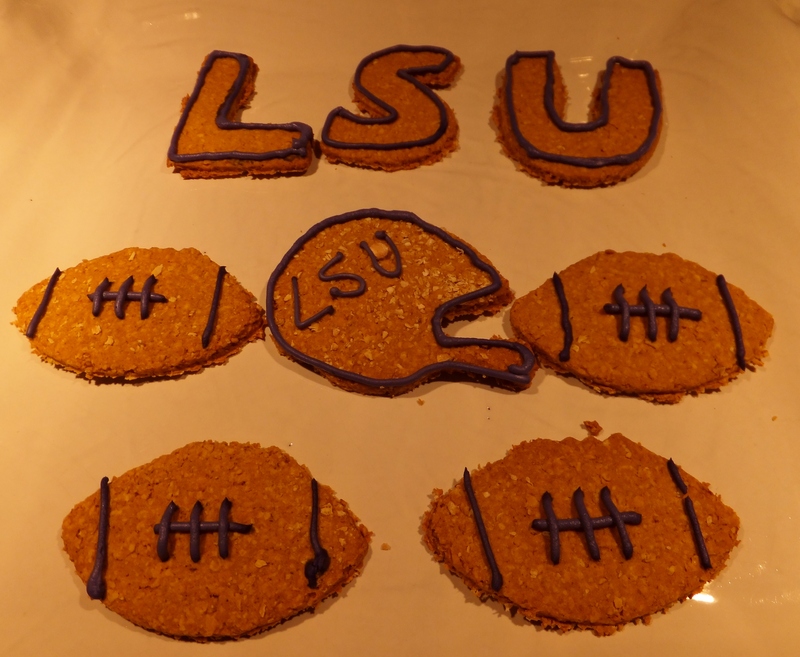 While I supervised watched, Mommy cut the rolled out dough into footballs, football helmets, and of course L-S-U. 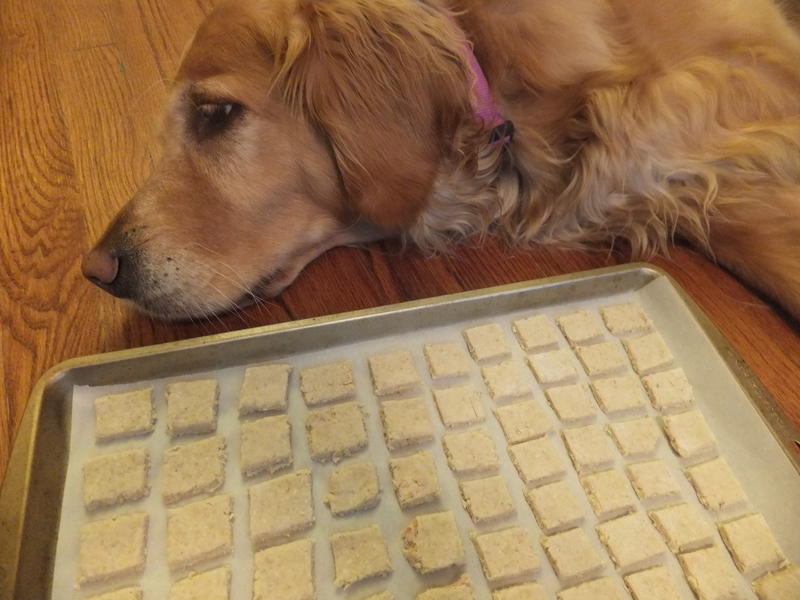 And then we popped the treats into the oven and waited for an eternity 30 minutes. 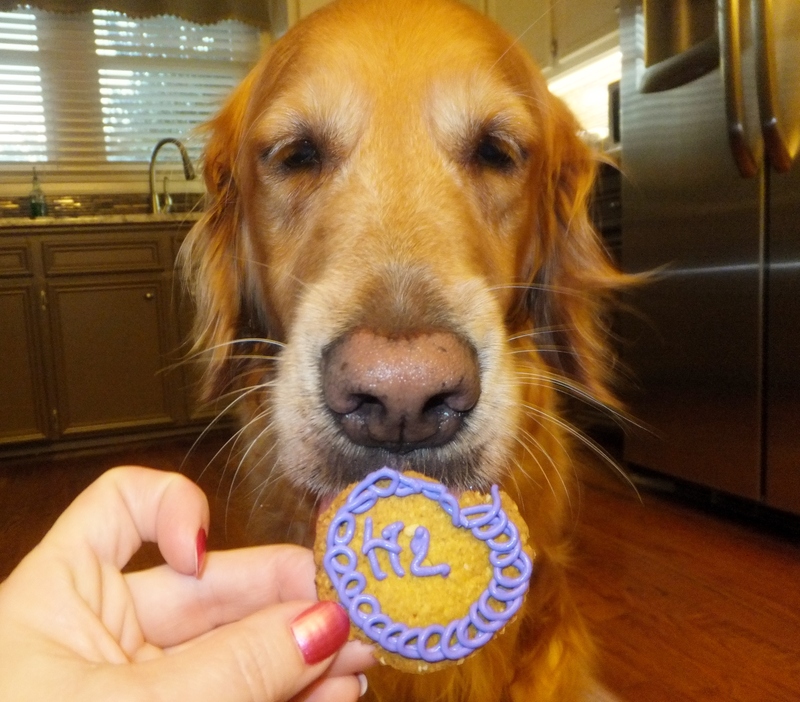 I let Mommy decorate the golden cookies with purple cream cheese frosting . . . perfect colors for an LSU tailgate. Now Mommy would have you believe that she planned for the treats to be gold, but it was just a happy coincidence thanks to the turmeric. She thinks that might be a sign of good things to come for our Tigers this Saturday. She thinks funny things like that when it comes to football. But I won’t make too much fun of Mommy’s silly football superstitions because she made this extra special cookie just for me, HL. It was gone in one bite. Yummy! We’ve packaged our canine tailgating treats and will deliver them over the next few days so that all of my doggy friends will have a little something to enjoy before the big game. Just a word of caution for my friends: Saving these tasty treats for Saturday may prove to be a bit of a test! So last night my human mommy/blogging assistant had a slight goof. Somehow the pushed the giant PUBLISH button before I had finished telling my story. What do you have to do to get a decent assistant these days? Anyway, my apologies to anyone who received that unfinished version of my tale. Here’s the complete story. I hope you enjoy. 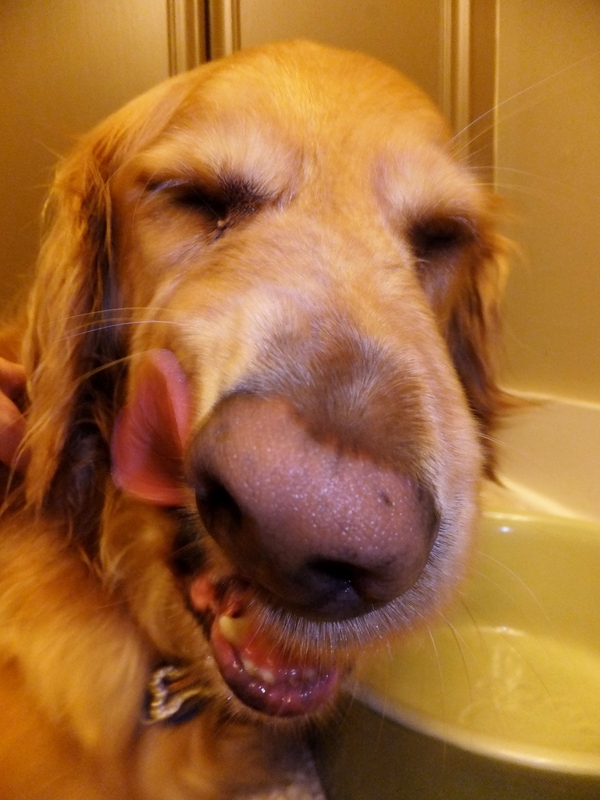 Last week I went to the V-E-T to have my teeth cleaned. This is me post-procedure. I probably don’t need to tell you that when it comes to anaesthesia I’m a little lightweight. I don’t remember much of the day, but I’ll tell you what I do recall: My human mommy forced me to rise and shine at what seemed to be an utterly ungodly hour of the morning. 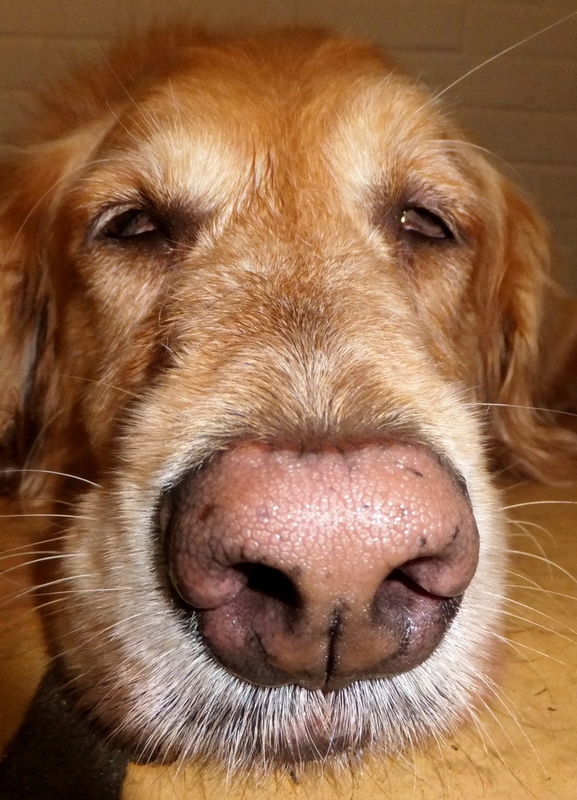 OK . . . so it was 6 a.m. . . . but I’m not a morning girl, so that was a bit of a jolt. 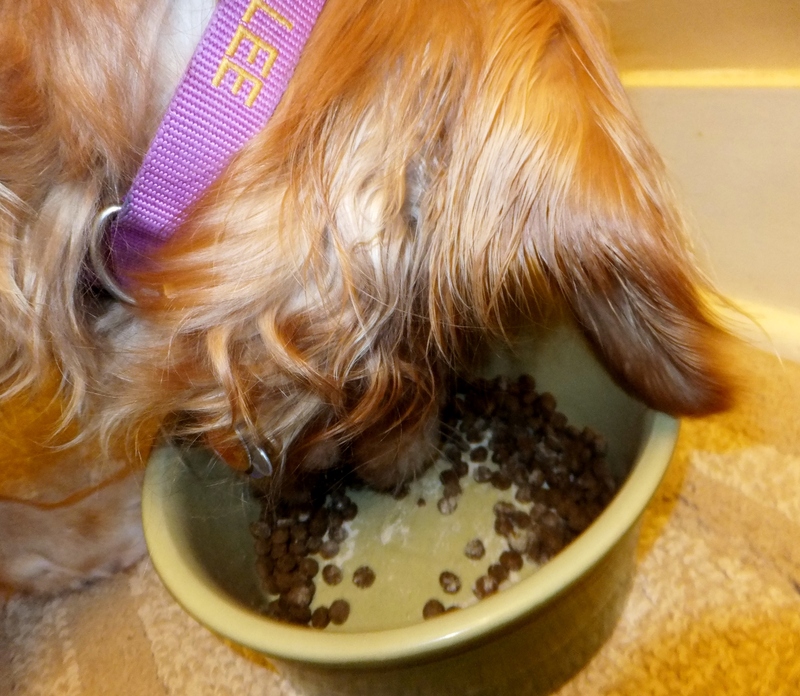 I staggered into the kitchen only to discover that my food and water bowls were missing. Then I remembered that I was denied my usual go-to-bed treat the night before. Something was definitely fishy. And that’s when we got into my chariot (what you would call a car) and started driving. Before I knew what was happening, we were at the V-E-T clinic. Now I’ve told you before that I love, love, love my vet, so at this point I was pretty happy . . . hungry, but happy. Unfortunately, that’s basically the last moment I remember from that day. The next thing I knew, I was back at home and Mommy’s crazy camera was flashing in front of my dopey face while she giggled. Isn’t that just typical of our humans? 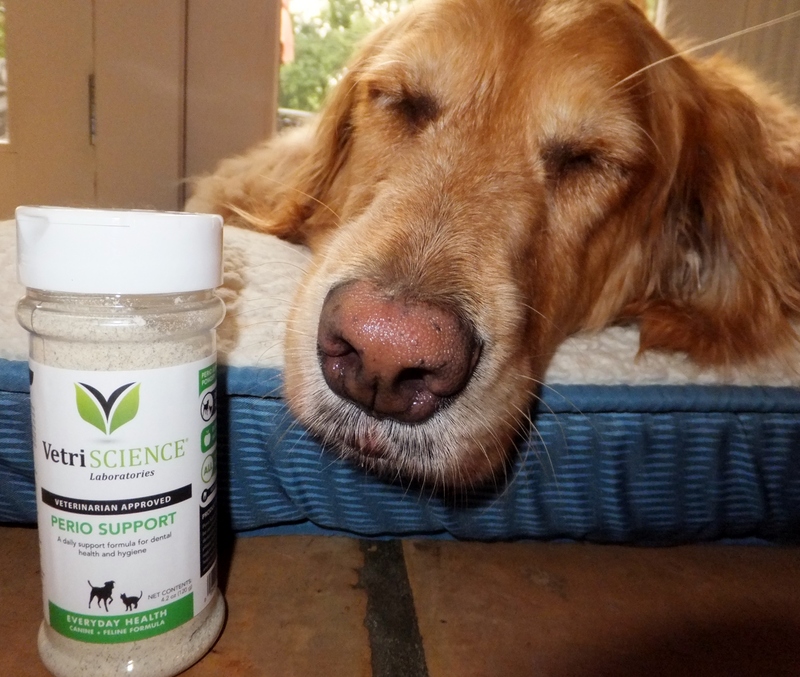 When I finally regained enough coherency that evening to eat dinner, Mommy sprinkled a bit of the Perio Support on my food. WOW! This stuff is fantastic. I’ve even seen Mommy sniffing it and saying something about it being good enough to put on chicken to grill for humans. Oh no you don’t, Mommy. 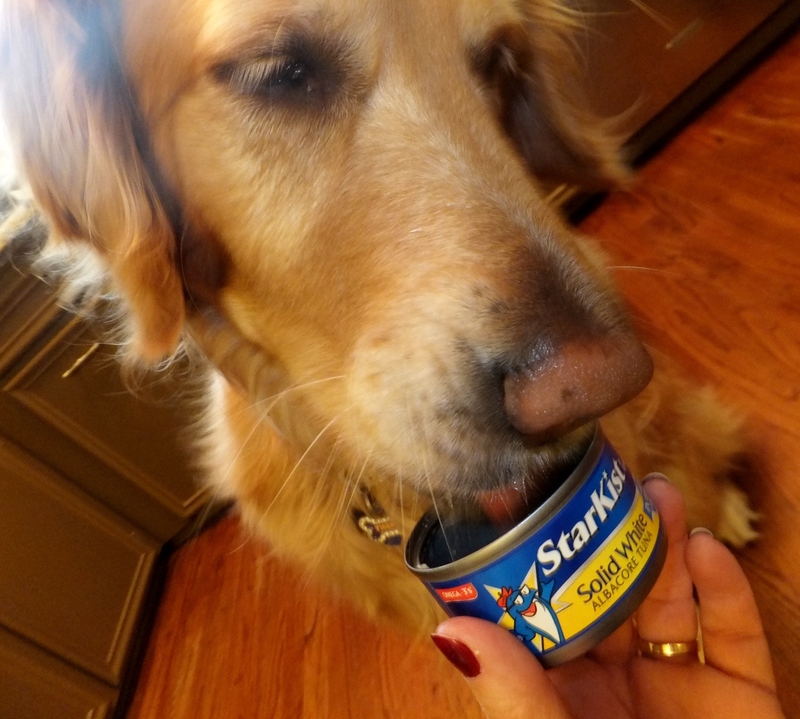 It says right on the label that it’s only for canines and felines. 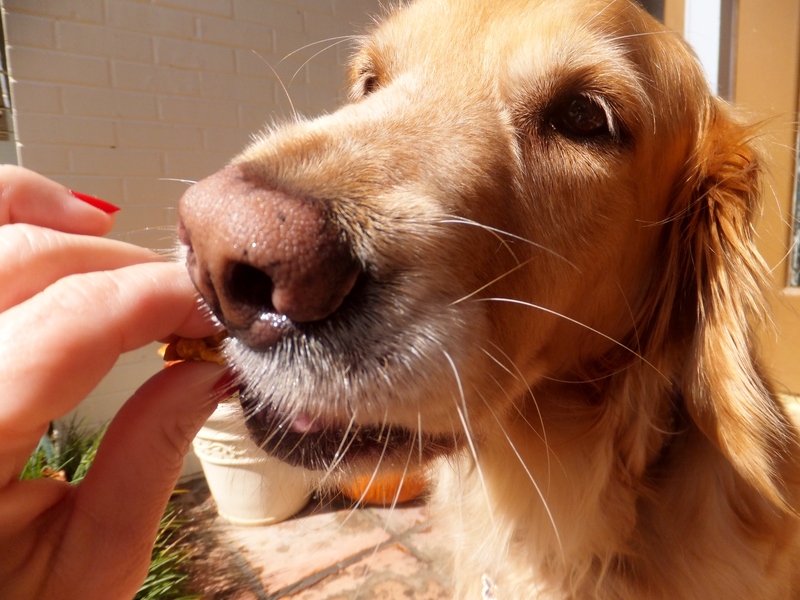 And it’s way too yummy for me to share, even when I’m slightly groggy!